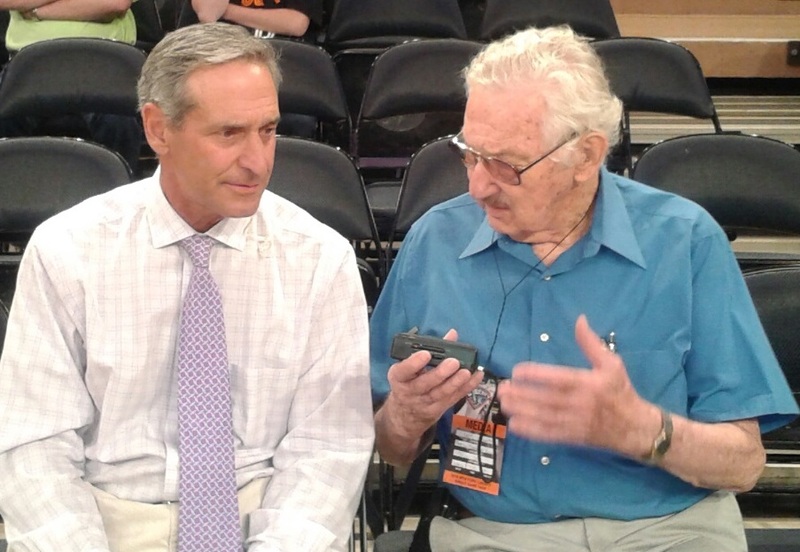 July 1, 2016- The following is an interview with veteran MSG Network announcer Mike Crispino conducted by ASA President Lou Schwartz, who was in attendance as the New York Liberty took on the Phoenix Mercury at Madison Square Garden on June 26. Schwartz sat down with Crispino, the TV play-by-play voice of the Liberty and radio voice of the Knicks, for a look back at his over 30-year career. Lou Schwartz: When did you get your first start as a sportscaster? Mike Crispino: It was at the University of Hartford doing Hawks basketball. I remember being an analyst with George Ehrlich. He had been the play-by-play guy at the University of Connecticut for a long time and then he came over to the University of Hartford. We traveled all over New England. I made $50 bucks a game and I thought it was the greatest thing ever because it wasn't like a job. It was something that I loved doing and I was getting paid to do it. It was special. LS: Was that the first indication that you wanted to be a sportscaster? MC: Well, it was the first job I had where I felt like it wasn't a job. Usually you have a job and it's a job. You're looking at the clock saying, 'When do I finish?' I have never ever said that in 30 years. MC: I was working in radio in New Hampshire and a friend of mine had gone to work for ESPN at the very early stages in the early 1980s when they just came on the air. She mentioned that they were looking for someone to do updates and I should send her a tape. They didn't have any programming, any studio shows. They were still trying to figure out what to do. So I made a little raw tape at a cable outlet across the street in Concord, NH and I sent it down there. She was able to get it on the desk of the person who was making the decisions and I got hired. I worked there for about six months doing updates. It was very rudimentary. We didn't have camera operators, but I do remember specifically that Chris Berman was also in this little office. Tom Mees, who passed away in 1996, worked there along with George Grande, Bob Ley and Greg Gumbel. Those were the guys working there when I walked in the door. They certainly had a lot more experience then I had. LS: How much were you getting paid then? MC: I don't remember but it wasn't much. Maybe $100 bucks a day. LS: And you would probably have paid them to be there. MC: Absolutely, even though I didn't know what ESPN was going to turn out to be. To be honest, I just thought it might be an opportunity. I had no experience so I felt I wasn't very good at it. The other guys had experience. They had been around television for a few years so they were much further advanced in their ability then I was. I was just happy to get a chance to be around guys like that. LS: What happened after that? How did you move up the ladder? MC: I went to work locally for an NBC affiliate. The good thing about working at ESPN was that I got to produce a tape so I brought it to a local affiliate in Hartford. I was a local guy since I came from Hartford, CT and that got me in the door. They said they wanted to hire a local guy that understands the market place and would be able to cover local sports. So that's how I got that job at WVIT in Hartford as a weekend anchor which led to being the weekday anchor. LS: Who were your heroes at that time? Were there certain sportscasters that you wanted to emulate? MC: You know what, not really. And I think that's interesting because a lot of people will say, 'I used to listen to this guy and that guy.' I think the first sportscaster that got my attention though was Bob Wolff right here in this building. Bob had a great voice, a real New York voice. I loved the Knicks and I just loved listening to him do games. He just had that classy voice. But I never thought I would be working in New York someday. Bob Wolff was like the top of the mountain and I was just down here somewhere. LS: At that particular time, did you ever dream that you'd be working right here in Madison Square Garden? MC: Honestly, I didn't have a lot of dreams. When you get involved in this business you take it day by day. You feel like if you can just get through this day and no one tells you to leave then you have another day. It's almost like you're on trial all the time. You're on audition all the time. That's the way I've been for 30 years. LS: We get so many inquiries from young people who want to become sportscasters. What advice would you give them? MC: You have to be passionate about sportscasting. Some people think they're passionate but then they start doing it and working long hours and not getting much accolades or even feed back. You have to guess at how well you're doing sometimes. So you have to have passion. You have to be willing to accept failure. Someone is going to tell you, 'You're not good enough. We don't like you.' You can't take it personally. You have to be willing to fight through anything. It's almost like being an athlete. There's always some one who's going to tell you that you're not good enough to be here. But all you have to do is find one person that says, 'We like you.' And if you keep finding that one person, you can keep doing this for a long time. I'm a perfect example. LS: If you weren't a sportscaster, what would you be doing now? MC: I have no idea. Maybe coaching somewhere. I do love being around sports. The sports business, since they early 1980s when I first started, has really expanded. There so many opportunities. I think you can find a ton of opportunities on the high school level, the college level, the pro level. There's chances everywhere because sports have become such a big part of our landscape. LS: Mike, thank you so much for your most informative interview. I believe many aspiring sportscasters will learn a lot from reading about your journey into becoming a successful sportscaster.